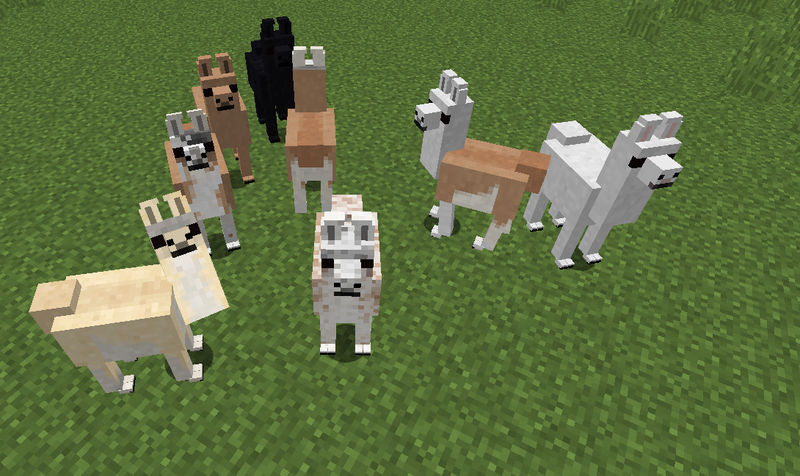 Hi, I'm working on a mod that adds every breed of every animal in Minecraft by adding every true-to-life genetics and then procedural generating their model and textures them based off of their generated genetics. AI behaviours based on their genetics are being added too! As it is now Chickens and Llamas are mostly done. This includes all genes, model and textures. Llamas and Rabbits will have shearable variations in the future. I could really use some feed back on how things are looking and would really appreciate feedback! the mod still has bugs and we are aware of most of them but I'd love to get feedback on the textures, models, and animations! I downloaded this mod to test in my own game. So far, it loads properly and it does not crash when items/chickens appear in-game. The chickens, I assume, spawn based on biome, and act like normal chickens. They come when I pull out seeds, and even their death animations don't cause any issues. Only issues I have is double-drop rate for items with no ability to pick up anything but one of each, and that the tinted/brown/white eggs do not stack. Though you're probably already aware of that. Outside of that, it seems to be working pretty good so far! Nice work. 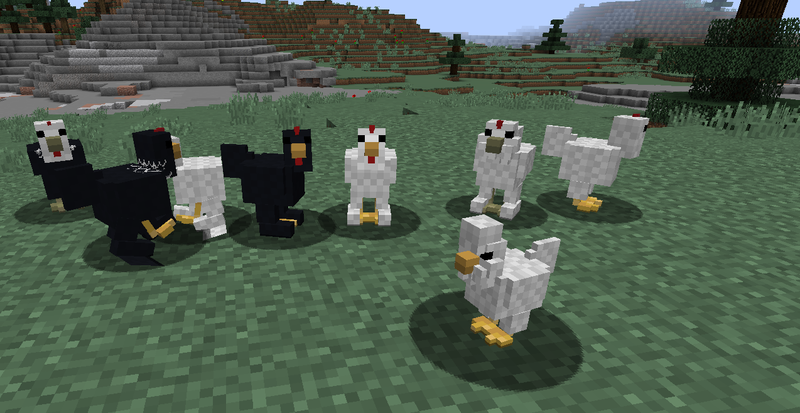 The variety of chickens adds a nice element to my own game, so I look forward to seeing this mod completed. edit: Oh! I should add I'm using the 12.2 version. My forge isn't up-to-date due to thaumcraft, so it's pretty stable in that regard too. Hi! thanks for commenting in the latest update for 1.12 the double items are no longer a problem. 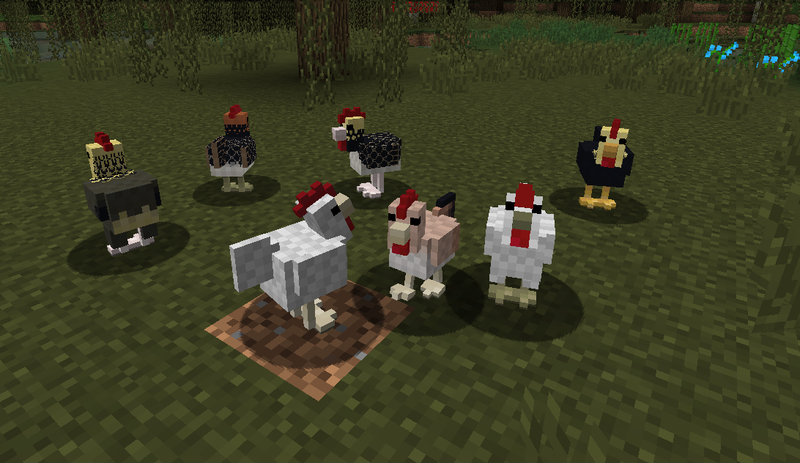 Also chickens have their latest textures backported from the 1.13 version and rabbits are visually up to date as well (many features are still missing however). I hope you'll consider making your own designer chickens and rabbits in the future! you can select for coloration, pattern, size, and various body features with selective breeding. Let me know if you need help with that as its to difficult to set up a wiki for genetics since its the real life genes.